In the natural environment, an oak tree can grow more than 100 feet tall and live for more than 200 years. The oak tree is a cold hardy, deciduous tree with a rapid growth rate. It thrives in most soil environments and can tolerate most pH levels. These characteristics make the oak tree an excellent selection for bonsai. Though the oak bonsai requires generous attention, its growth rate and tolerance allow the tree to quickly repair itself after pruning and can easily be transferred from outdoor to indoors. Select a sapling oak tree for bonsai. Choose a young oak tree with little or no branch damage. Do not select oak trees that show signs of yellowing or discolored foliage as this could be a sign of a root bound system. Place the oak tree on a clean surface and remove the tree from its original container or bindings. Remove the excessive soil from the root system. Gently untangle the root system. Use sharp, sterile pruning shears or scissors to trim away any dead, dying or wilted roots from the system. Create a well-drained loam for the oak tree. Mix equal parts of nutrient-rich soil, organic compost and fine, clean sand. Incorporate the mixture thoroughly. 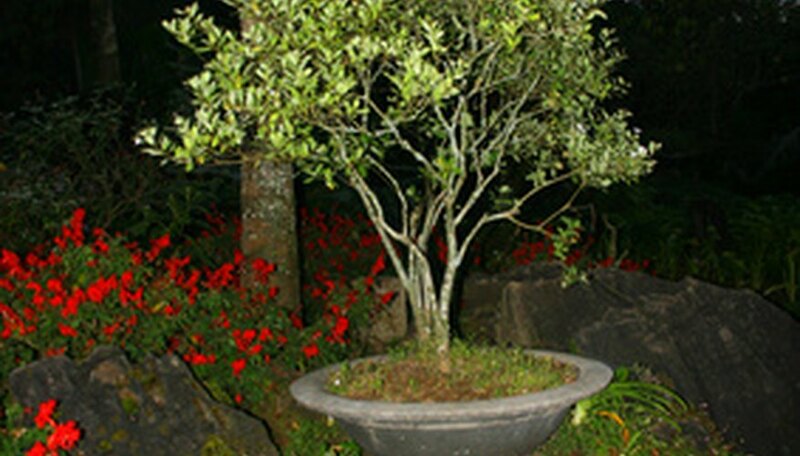 Plant the oak bonsai tree in a well-drained planting container. Select a container that is slightly larger than the oak tree’s root system to allow room for growth. Ensure that the container’s depth is slightly larger than it width. Line the bottom of the container with a layer of soil. Position the oak bonsai tree in the center of the container and fill the container with soil. Make sure that no roots are showing from the surface, then press the soil firmly around the oak tree so that it stands upright. Irrigate the newly planted oak bonsai thoroughly with tepid water until the water flows evenly from the bottom of the planting container. Allow the oak bonsai to rest until the water no longer flows. Place the oak bonsai in a location that receives at least eight hours of full sunlight each day. Choose a location that is away from direct sources of cold and heat, such as a heating vents and drafty doorways. Prune the oak bonsai during its dormancy period, between the late fall and late winter months. Use sterile pruning shears to prune away unhealthy foliage and stems. Trim interior branches to promote good air circulation and light penetration throughout the tree. Develop the shape of the miniature oak over the course of several growing seasons. Cut away newly developing foliage throughout the year to promote the development of smaller, more appropriately sized leaves. Distribute fertilizer evenly around the oak at half strength just before the onset of its growing season and again at the end of the growing season. Use a well-balanced, slow-release fertilizer such as an 8-8-8 or 10-10-10 combination. Water the fertilizer in thoroughly. Repot the oak tree once each year or as required to prevent a root-bound system. Always use fresh soil when repotting.